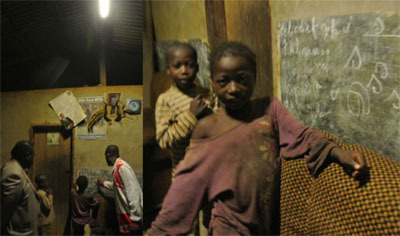 Residents of 15 villages in Cameroon waited years to be put on the electrical grid. Now after Greenpeace and partners facilitated a project installing solar lighting, they’ve gone from living in darkness to having light. With new light in the villages, things have begun to change. Instead of using a petrol lamp and going to bed early, people stay up. Workers come home from the fields and sit together to discuss community issues. Women are using the extra time to sit together and make baskets or food to sell in urban centers. Children stay up late to read — by choice. Because people can see at night, there have been fewer incidents of stepping on snakes or other animals. People can identify what’s making a noise quickly, heightening security. Young people who left the rural area for urban centers are starting to return to see the solar development. These are just some of the examples of what Christian Gyr, Greenpeace Climate Caravan and Solafrica project coordinator, has seen as a result of the solar installations and work thus far of Climate Caravan, also known as Climate and Forest Solution Caravan or Project of Organization and Development of Communities (PODC). 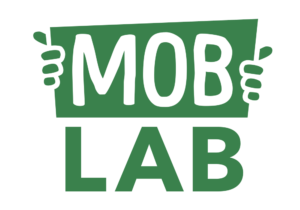 MobLab recently caught up with Christian via Skype from Cameroon to hear about the impact of the project and the challenges and lessons organizers face going forward. How is Greenpeace approaching the problem? Greenpeace started forming the idea of Climate Caravan, and bringing photovoltaic solar energy to remote Cameroon communities, in 2009. Organizers saw the need to go deeper and work from the community perspective, rather than only using Climate Caravan as a campaign tool for communicating Greenpeace’s solution work, Christian says. “At the beginning, that was very important – what is Greenpeace doing to solve problems and not just denounce and cry out when bad things happen?” he says. “Greenpeace Africa was very interested to have a solutions project that works with people, with local communities, prompting solutions for their livelihood,” Christian says, noting this included demonstrating quality of life can be improved without destroying forests or contributing to climate change. Greenpeace looked to organize in a participatory way, and has been working with local partners and providing community building training and tools. Gaining partners on the local level and showing more understanding of the grassroots issues increases legitimacy for policy work, Christian notes. 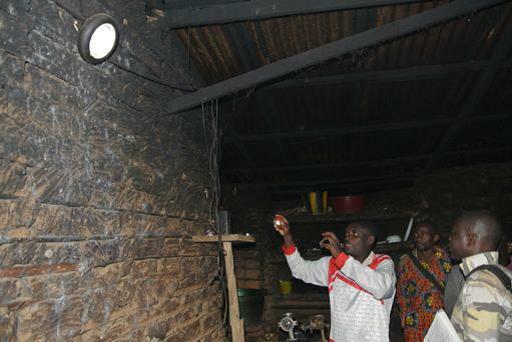 A community technician explains how the portable solar home system in his house is used how to ensure its long life. The project work has changed to a humanistic way of working with and for communities, rather than working through communities for campaigns, he says. Africa is full of failed development projects, Christian quotes the Ghanaian Prof. Ayittey. Central Africa is home to the ruins of projects that came and went in many communities. Politicians, elites, NGOs or agencies often start these projects but run into difficulty completing them successfully or making them last, Christian says. “We knew about these challenges … we knew we could not go as Greenpeace just to repeat the same story again,” he says. Local organizations that have partnered with Greenpeace for the project include Young Green Association of Cameroon (AJVC), Cameroonian Association for the Protection of Childhood and for Community Development (ACCEN-DC), African Indigenous Women Organization, Young Cameroonian Youth Party Organization, Organization for Vulnerable Children and The Center for Environment and Development. Instead of travelling to communities to show the technology the idea arose to train people within communities. “Several local partners thought that would be a good thing to try, to start a project that would not just work on one issue, on solar energy or energy access, but that would actually try to start solving with the community their real problems,” says Christian. A survey in 15 Cameroon communities revealed many different mentions of problems that were multifold, says Christian. The three main problems were energy access, water access and access to a proper health service. 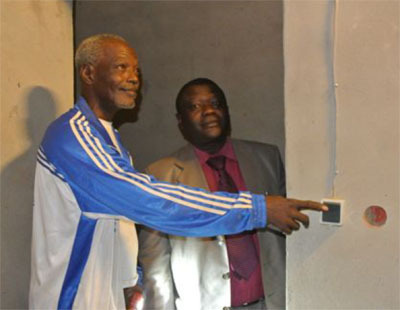 A village resident shows his guest the functioning of his 160-watt solar energy installation. Climate Caravan is tackling these three issues starting with solar energy access. Active in 15 villages in northern and central Cameroon, the initiative is now completing its solar energy phase after two years of work. Organizers negotiated contracts with private and public partners. The program provided training for community solar energy technicians, who can solve problems as they occur in the community. In addition, traditional knowledge in the communities is recognized and combined with scientific knowledge. “It’s not about creating new dependencies by introducing solutions that after cannot be handled by the communities,” Christian notes. Rather than offer training that would last only a couple of days, organizers decided to offer three weeks of theoretical and practical training on solar energy, climate change and sustainable development to equip residents with the knowledge and know-how to install the projects. Last year, 40 community organizers from all regions of Cameroon, as well as the Democratic Republic of Congo and Togo, were trained. Project organizers will replicate the training process within the community in the next two phases. An important differentiator of this project is its use of psychosociocultural methodology, a scientific and humanistic approach developed and introduced by partner organization Afro-Brazilian Research Center (CABEPEC). The purpose is to promote the organization of communities and sustainable development in the villages. The approach views and treats people within their psychological, social and cultural context, and sees them as a whole rather than fragmented. Community organizers are trained in an approach that considers people’s ideologies, religious preconceptions and ethnocentrism. “This project is about change. You can only change if you also change your behavior. 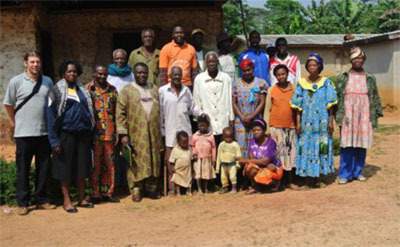 If a community does not change it will disappear because the context of this world is not favorable for rural communities in the dark forest of Cameroon,” Christian says. The solar project has run into the challenge of paying salaries for people involved with the project, many of whom start as volunteers. Hosting organizations intended to take over more of the payments, but it became a challenge. Greenpeace Switzerland heavily subsided the solar energy material until the end of 2012, when they wanted to see the money come directly from communities. Local partners have different motivations for working with Greenpeace. The project changed its host organization several times. “The motivation is not always the same or not always transparent at the beginning,” Christian says. Local organizations can boost their own fundraising using the Greenpeace name. This needs to be kept in balance to ensure it is for the common Climate Caravan project and not another interest, and avoid misconception that Greenpeace is providing all the financing. Because the goal was to build and develop community, bringing in financial and technical expertise, as well as coaching, from the very start was important. Each beneficiary in the communities that received solar material signed a contract for their individual contribution of between 50-100 percent of the real costs. While Greenpeace thought it could see its outset money returned in a year, it took two years because when people applied for the installations they were optimistic about how much they could contribute. The challenges for citizens’ ability to pay back include seasonal issues — climate change is being felt in the communities, making it difficult to know when to prepare the fields and plant — as well as overall health issues leading to death in some cases. “One of the really hard lessons for us is you cannot depend on the poorest of the poor for project financing. That was (one of the) ambitious goals of this project, to make the project independent after two years running,” Christian says. Cameroon has a very diverse population, with more than 250 ethnic groups that often have strong ethnocentrism. Christian notes this often leads to conflicts, even within the teams. Organizations are often organized around one ethnic group or family, making it difficult to build up a multi-ethnic project. Cameroon has a level of corruption that is among the highest in the world. This corruption is especially felt in the judicial system, where judges are bought. High politicians are involved with private and foreign enterprises that are buying up Cameroon’s rural areas. Christian recalls a meeting in November 2012, when the campaign director from Greenpeace Africa asked to discuss campaign approaches and solution work in the Congo rainforest. The director iterated the same question: What contribution does Climate Caravan make to systemic change? The Chief of Assok, members of the Elders’ Council and some of the project beneficiaries with the PODC team and Ministry of Water Resources and Energy delegation. “It’s a good question, and I think it’s a good challenge for us,” Christian says, noting that although this is the goal there are a lot of issues. “When you ask for systemic change, you have to think about how to reinforce the law that is existing in this country and that means you have to work on corruption, you have to work on integrity of the political systems,” he says. Cameroon is rich in natural resources, which brings a lot of mining companies to the country, making foreign interests part of the problem, he adds. When communities are strengthened and have more capabilities, they are in a better position to resist “contracts of shame,” like those Greenpeace has documented in the Democratic Republic of the Congo. Though Climate Caravan is moving into its next phase of work, the organizers have heard from more than 200 community leaders who want to be brought into the solar project. The solar energy work can continue through Cameroon Solar Solutions, a social business formed in 2012 that works with the same staff trained in community organizing and solar energy and insulations. Solafrica, a small organization, is doing a lot of fundraising for the project. Representatives from the ministry of water resources and energy expressed interest in the solar project, and replicating it in other communities, Christian says, noting there are approximately 10,000 communities in Cameroon without light or energy access. Cameroon Solar Solutions is discussing with the ministry how to change the terms of reference for public-private partnerships, to create an “ecological and sustainable” process, Christian says. Next up is the water access phase of the project. Climate Caravan is looking at water management and ways to reduce disease in water.